Jerry Jones was a wreck during Sunday night's loss to the Eagles. 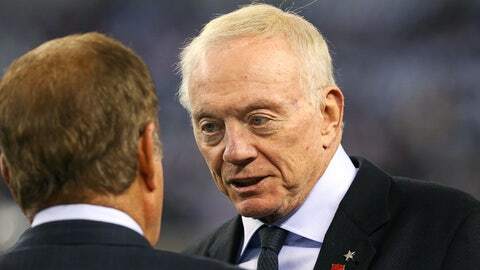 It’s always fun to see shots of Jerry Jones in his owner’s box during Cowboys games. He didn’t disappoint during Sunday night’s Eagles-Cowboys win-or-go-home showdown in Dallas. The Eagles ended up winning 24-22 to win the NFC East. They advance to play the Saints next Saturday in Philadelphia. But let’s get back to Jones. Then Kyle Orton threw an interception that pretty much sealed Dallas’ fate and the double-thumbs up kid ripped his shirt off. And just like that the Cowboys’ season was over.